The first half of 2015 was dedicated to the Regional Quilt Festival in KC. Getting specific tops done and then working on the binding and sleeves for those quilts in that show. The second half of 2015 was dedicated to making scrappy quilts, working on new scrappy quilts inspired by items seen on Pinterest or other places. Near the beginning of last year, before the show, I was focused on prepping lots of mini quilts for quilting on my small quilt machine to help me feel more comfortable at free motion quilting. And then, the quilts all landed in a pile in the corner and were forgotten. This March, I am going to start off with reviving as many of these tops as I can, in preparation for some free motion quilting on larger items. Some I purchased, some are leftover blocks, or other creative mistakes or other things. Here’s what I posted earlier this month in my March Goals post. This doesn’t include other tops like Gemini Sky, Hexadaisy Rings, Weave, the DNA quilt or the 1/3 quilted Samurai Sudoku quilt, not to mention several others that I may also have in a pile that I haven’t reached yet. While each top has its own story, there is just too much on some of these quilts for their own separate blog post. And truly, some quilts have less of a story than others. So this will discuss some of my quilt tops in a group. This post may not be in the order I actually work on the quilt tops, as I am writing these posts prior to the work during March (see March-A-Long for details if necessary), in preparation for what I am going to (hopefully) work on this month. Today I am going to talk about the quilts farthest along – the basted/almost basted ones that I have 8 pictures above in the last group. 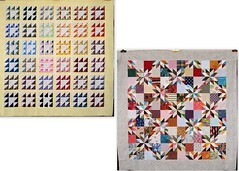 I have made several quilts and had either left over blocks, unused blocks, or just pieces that I wanted to keep as a small momento or to give away that remind me of other quilts. The practice corners for my Dancing Ribbons Quilt. The red and white checkers from my Fans and Bows Quilt. Some of the leftover pieces from my Exothermic Wonders Quilt. 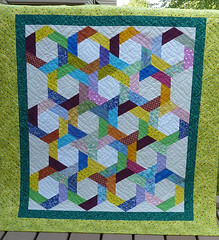 The practice green-on-green blocks that went with one of the first Twilter swaps (when we were part of Quiltcast Supergroup before we were Twilters). I had multicolored blocks I swapped instead, this quilt I purposefully cut into three sections so I could see how three quilts next to each other would look, I plan to quilt and bind each piece separately. This is also a “monochromatic” study of yellow greens and blue greens together in the same quilt. The strip on the right is meant for FMQ practice before quilting the part I want to keep. And the four quilts that mean a little less meaning to me. I have fond memories of a few of these, but they are not tied to any other quilt out there. The green and black ombre quilt. I made this one with a piece of ombre fabric I purchased at fabric recycles. I cut diamonds and organized the quilt top and I didn’t have a great plan for it yet. Decided to baste as it is with black batting and green backing. A four part baby quilt that someone made of just squares on point. I plan to do heavy FMQ on this one at this time. And finally the pastel panel that I cut up and sashed. This fabric was gifted to me as a member of our guild by a lady from our guild who designs several quilts and works for quilt market on various projects. I think the story is she had leftover fabric and we could do what we wanted with it, hoping that we would make things for the guild auction for the big quilt show last year. Wow this is a lot of small quilts! May take me all of March just for these! I have a feeling once i get going on one, the rest will be easier to start. Don’t forget about intending to quilt in the month of March! See my last March-A-Long post for details. I just finished a post, but my device didn’t have memory to upload it. Here’s a test post to see if it will post without pictures. As soon as I get back I can be more thorough. Hope you are able see this pic. If not head to Flickr. I was relistening to my podcasts about the angles in quilting. This quilt fits all the categories. There are ‘triangles’ that are created in the middle of two rings, there are individual trapezoid fabrics that make up the rings, and the white fabric in the middle are hexagons. This is fun scrappy, but could have some different pizazz if there was directed a little bit. Maybe I’ll put it on my ‘to do list’. Some of them are little marvin pictures who are put in all sorts of fun locations. I just had to share this little picture from Linda Rotz Miller on flickr. I friended her a while ago and she’s amazingly productive, more pictures faster than about anyone I’ve ever met before – even Pam. If you’re a flickr user, be sure to friend Linda. This particular post is about the number of half square triangles found in two different quilts that look totally different. Check it out!